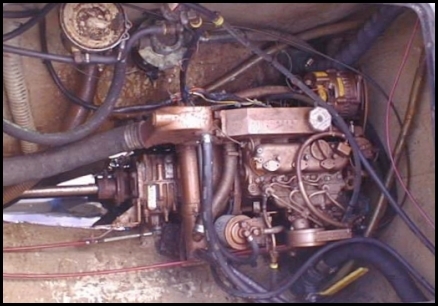 When I found this N-30 for sale one aspect of the boat stood out - the engine! I knew from searching the few records available on-line that these boats came out with a Volvo diesel - and this one instead had a Universal M3-20 - 3 cylinder diesel that looked pretty decent (from several photos.) I took that as a “plus” for the purchase because getting parts for this engine is a bit easier than some others. 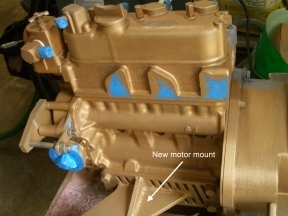 The M3-20 block is made by Kubota diesel (Japan) and has been “marinized” by Universal (Westerbeke) in several sizes over multiple years of use. The fact that I had some previous (good) experiences with another Universal diesel in a different boat also helped to push the confidence factor a bit higher for this candidate. The installation in this boat however was in fact extremely poor with little attention paid to a lot of things but it did start up well, minimal smoke, idled pretty smoothly so from all that I could see at the time, it looked like a “plus” for a boat that had a lot of “minuses” in the overall condition of things. There’s a long story about having to move the boat about 20+ miles to haul her out that involves the engine but I’ll save that for another time along with the part about stalling out and dying just before I was to go thru one of several overhead bridges that had to open up for marine traffic ... needless to say it was an “interesting day” - one that I’ll not forget. If you’ve checked out my progress on working on the hull and the interior, you’ll know that I’ve not been working much on either for some time, but I have been working instead towards resolving a rather “pivotal decision” regarding the engine that needed to be made. The photos I’ve attached will help to understand what was at stake and what appears now to be possible. Hopefully some of the readers might be able to use this information to their benefit in their own “rebuilding” endeavors. When the engine was in the boat, there was little if any visibility to the front (and very limited access physically) so it was hard to see this issue without some contorted positioning and the use of mirrors. 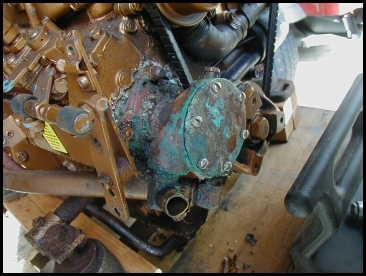 What was “easy” to see once the engine was removed was that there was a great deal of salt water corrosion around the base of the water pump. 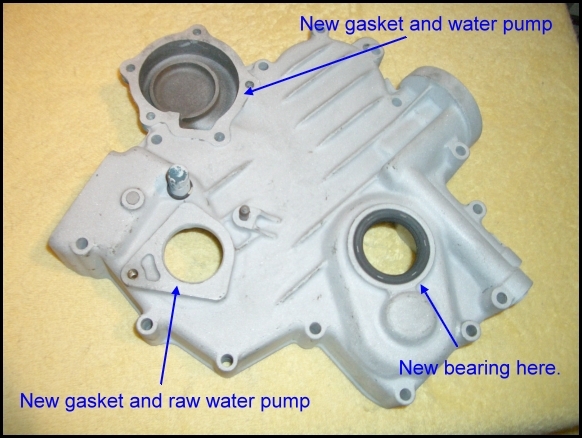 The basic issue was the loss of a seal around the water pump shaft which in turn promoted a nice “salt water flow” in and around the entire mounting base for the pump - which when left as it was, had eventually resulted in the “eating away” of the aluminum casting that the pump was mounted to. 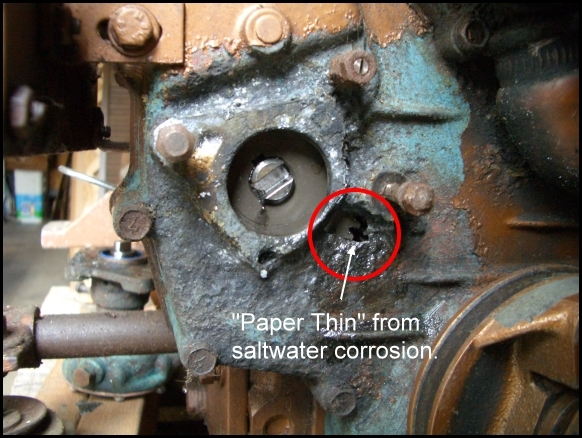 The photo below shows a close-up of what was left after simply touching the eroded area with a screwdriver - once the thinnest portion was broken, exposure to the internal gears would have been possible. It is fairly common among the various engine manufacturers to share components between multiple engine sizes. 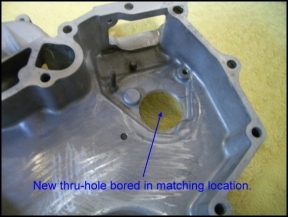 In this case, the cast aluminum surface did have at one time a flat area that would have provided a sealing surface (with a functioning gasket) to seal against. As you can see there isn’t enough of a surface to seal much of anything and with the thin wall breakthru, it’s only a matter of time before the interior would be exposed to saltwater and ruined beyond a reasonable repair. Is it time to scrap the idea of using this engine or are there other alternatives? A good number of readers know about my purchasing habits for boat parts via Ebay but not many know that I waited almost 8 years to find the part in the photo to the left and that I “stole” it for less than $5.00 (including shipping) and am now at least in a position to reasonably bring this engine back to further life. This aluminum casting is a part of the “Gear Case Group” and sells on some web sites with marine parts for as much as $ 560.00 - which wasn’t ever going to happen in my case! My mistake for several years was in focusing on finding “marine engine” parts. They simply weren’t available as a stand alone item. I considered several times just buying another M3-20 engine but that too never really became a viable solution as the costs were half or better of just buying a totally new engine. After a point, it was either find a way to fix this or pay the price for something new! After a LOT of searching, cross referencing and double checking, I found that the Universal M3-20 block (D-640) was the same engine block as what was sold as a Kubota G-6200 lawn mower. 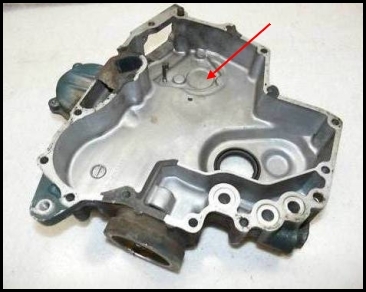 That was the breakthru information that changed the scope of my searching and once I started watching for those parts, the options opened up one day when this part and several others from a G-6200 mower were being sold. I also picked up a oil pan (with no rust or corrosion) and an oil gear pump that turns like new - and I still had a good deal of change from a “$20.00 bill”- patience may be a lot of things but in this case, it was one of the primary factors that made the rebuild for this engine possible. 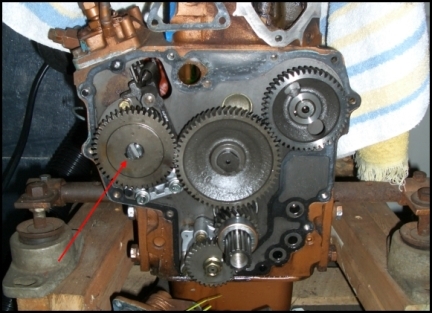 In the photo above, the red arrow is pointing to the area that has to be bored out to accept the water pump at the specific location to align with the slotted shaft on the engine that drives the pump - shown in the photo below. The case not only protects the internal gears but permits specific oil paths and coolant paths to be connected. It was a relief to see that no rust or contamination had reached the inside areas and with some care in boring, the alignment with the newer case housing would permit everything else to remain as it was originally built. The aluminum housing is now bored out to take water pump flange. Here’s the almost completed housing - ready to re-install. Almost all of the parts removed from the engine are being sandblasted (to remove the original paint and scale) and will be re-primed and painted with a high temperature engine paint in a close match to the original paint color used by Universal on these engines. Stripping the paint from other areas on the engine has been a time consuming (manual) task but it will be worth it when it’s all repainted and re-assembled with many new parts to extend the potential life of this engine. There was no hour meter on the boat when it was purchased so there’s really no way to know exactly how many hours were on this engine. 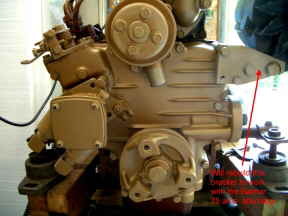 My “best guess” is based on the age of the boat and when these Universal M3-20 engines were introduced to the market. They were available sometime around 1988 and on into 1992 before being replaced by the M3-20B version with slightly more horsepower. I’ve assumed that the engine was replaced (for what reason - we’ll never know) in 1990 and that given the overall installation quality and attention to details, I don’t believe it was used that much. I bought the boat in 2000 which leaves 10 years at 40 to 50 hours per year (if that) for an estimate of 400 to 500 hours on the engine. From the visual condition of the engine alone, that seems like a high number but there are multiple clues that also go into making that guess. The exhaust elbow (with water injection) was not that badly worn or corroded and appears to be the original for this engine. In warmer climates, salt water takes a heavier toll on almost all metals and things don’t deteriorate as quickly if they’re just sitting in the water as opposed to being used. Other areas like the air cleaner / filter - looked to be original (again not likely after 10 years if it was used much at all.) The heat exchanger still has a reasonable flow thru and I would bet serious money on no one replacing the zinc electrodes on that item - so it appears to me that from a “best guess” scenario, putting this engine back in the boat after replacing several items prone to wear and corrosion (raw water pump, fresh water pump, hoses, heat exchanger, thermostat, alternator, etc.) I should be able to get another 1k or 2k hours out of it without major issues. One additional issue that supports this approach was the engine oil analysis that I had done just after pulling the engine - it showed no significant chemistry items that would suggest further problems based on past use. Had that not been the case, I would have more likely opted to replace the entire engine with either a new or used alternative - in either case at a much higher cost than the bills for the restoration being done now. There’s still a lot of work to be done in getting everything re-assembled and checked out before re-installing the engine back in the boat. I’ll add in some additional photos along the way to show the progress. Not all engine manufacturers have “alternate” opportunities with “marinized” versions, but one of the options I had considered IF the choice was to buy a new engine was the BETA BD722 - you can do the homework on them and find they too, promote the option of not having to buy parts from your local marine sources at inflated prices. They too, use a Kobuta block in their engines and I tend to think that when someone does something right and does it enough times, the results are probably better than average. That doesn’t mean there won’t be some surprises, but they should be fewer and “further between” than others. BTW.... I found a new set of (4) motor mounts (the same as the ones sold with the Beta engines) on Ebay and ended up getting them for less than half the price of a new set. It really does “pay” to be patient and persistent in your searches! Progress is being made on the re-assembly of the parts after they have been bead blasted, primed and painted. Gaskets and seals have been a challenge to locate and in some cases, more expensive than they should be, but after 20+ years the success is in FINDING the parts not in disputes of relative value. A larger view of this photo shows a reference to rebuilding the alternator bracket to permit fan clearance on a lightly used (Ebay-yep!) Balmar 75 amp alternator along with the electronic regulator module. I knew this unit would require some modifications but gaining the extra amp output over the original 51 amp alternator is worth the effort at this time. Finding a replacement alternator was the goal but finding one that would fit with the clearance needed was the problem. Of all the searching and checking to find some items, this detail probably took the most time simply because not all vendors provide accurate or even legible pdf drawings and the amount of “third party” aftermarket items almost overshadows the real companies selling real products. After all the checking, it was satisfying to get a good result for this issue. Another view of the engine with the newly painted parts back in place. Masking off areas that have been cleaned or places where you don’t want to have paint is as important. Not everything goes together at one time and having too many “open holes” is a sure way to get some surprises along the way. The larger view of this photo will show the note about the new motor mounts that were made and installed here. The old ones did not work well to secure a specific position and keep it there. They were the originals that came with the engine and worked somewhat evenly IF your engine was to be mounted on a flat level plane. The new ones promote a slight tilt that is required to align the prop shaft. The new motor mounts help to reduce the footprint (width) required for the front two locations and attach to the block in four existing tapped hole locations. 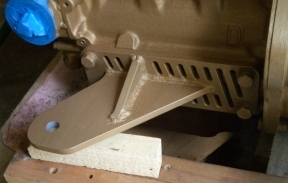 The wedge shaped gusset bar you see in this photo is counter matched by two more not seen on the underside to limit any tendency for fatigue cracking anywhere. The blue taped area just above and to the left is the oil filter (horizontal) screw on position which will now receive an adapter plate and two hoses to permit a vertical (and far more accessable) oil filter position inside the engine compartment. Nothing stains like used diesel oil and keeping it out of the bilge is in everyones best interest.